Catholic Church in Colby Undergoes Interior Restoration - Church Interiors, Inc.
Beautiful churches that were built more than a hundred years ago sometimes need restoration, especially if the ornate artwork that graces the walls starts to deteriorate from age. 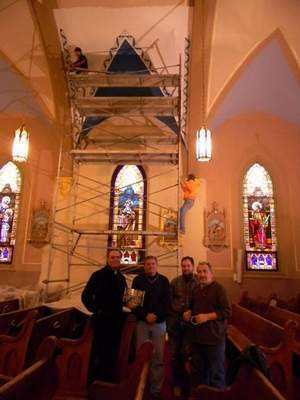 At St. Mary’s Catholic Church in Colby, restoration of the interior of the church has been in the planning stage for more than a decade. “This already beautiful church that was built in 1904 will be more glorious,” said the Rev. Daniel Hackel. He has been at St. Mary’s Catholic Church for three years. “The parishioners are very excited, and we hope that this joy will extend out into the community,” Hackel said. “There have been fundraising campaigns within the parish and through the La Crosse Diocese.” About 11 years ago, a committee of church members was formed to begin planning for this restoration project. Norm Becker, committee member, has been involved from the beginning. “We put a copper roof on the church several years ago and replaced the windows — all in preparation for this restoration, he said. “It’s exciting to get it (the restoration) going and to keep people energized about it. 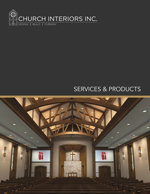 Generations of families come to the church.” With the planning completed, Church Interiors Inc. of Highpoint, N.C., was consulted about the church renovation project. 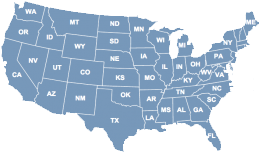 “We’ll do a complete (interior) restoration from the nave through the church (sanctuary),” said Joel Skinner, regional manager of Church Interiors Inc. “We’ve renovated churches throughout the country. We came here in the summer and put together a plan to restore the church’s interior back to what it used to be. “We’ve looked at old photos, and we’ll test different colors; then we’ll review everything we’ve done,” he said. “We do a sample to show everyone what it will look like, and we plan to finish in mid-summer 2012.” Skinner declined to discuss the cost of the restoration. Some of the work includes painting, decorating walls to the ceiling and 84 pews will removed, restored and returned. More space and handicap accessibility will be added. New altars and new kneelers will be installed. There also will be a new porcelain tile floor with a St. Mary’s medallion depicting a story. Inside the sanctuary, 14 stations of the cross depict the story of Jesus’ passion, Hackel said. “We’re enhancing them,” Skinner said. “The church is most beautiful when it is full of people, full of souls, full of children — that’s when it shines the most,” said Jim Stathopoulos, on-site superintendent. “The future of the church lies with the children. What a wonderful thing.” The artwork especially is beautiful inside St. Mary’s Catholic Church. The art and stained glass windows tell a story, Hackel said. “Art heightens our senses for worship to God. God gives us ability to do (create) art and we give it back to him (in worship). “People (the parishioners) have exhibited a lot of faith and hope,” Hackel said.